To attract top level talent into your organization and integrate the best strategy to do so, download this report. High potential employees are more likely to use mobile devices in their job search, meaning HR leaders and hiring managers must also integrate a mobile recruitment strategy into their hiring process. 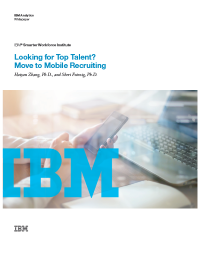 IBM’s Smarter Workforce Institute analyzes how high potential candidates say organizations using mobile to hire are more attractive.